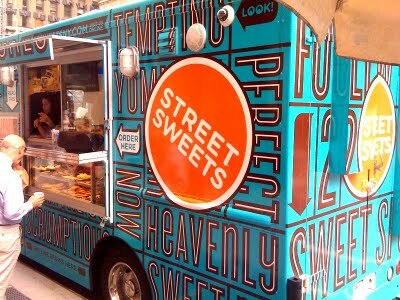 Not to be confused with the Treats Truck, which was reviewed recently, this truck is also an outstanding place to stop for a snack. The great thing about the new trend to sell sweets this way is that it’s getting easier and easier to turn a corner and stumble onto one. My friend and I were pretty full from lunch, but we passed this truck as we were walking to the subway and decided we could probably both manage to find a little more tummy room. I had the coconut macaroon (very thin and crispy) with a layer of nutella and OMG it stopped me in my tracks. Wow. Absolutely fantastic. Crunchy, just sweet enough and perfectly complimented by the perfect smear of hazelnut goodness. My friend was equally impressed with her cookie. Plenty of other things to try the next time I spot the truck! Look for it near you!